Planning a bathroom renovation can feel quite daunting to the average homeowner, but it can be exciting too. We’ve compiled this handy reference guide that covers the main items you’ll need to consider when the time comes. Our skilled and experienced Bathroom Designers will advise you and design your dream bathroom. The absolute starting point is to work out your needs, priorities and preferences. Once that’s done, we then bring these together into a cohesive design solution. The following elements all form a part of the overall project and will need consideration. It will help you to have considered some of these bathroom basics before meeting with your designer. Your bathroom floor is almost-always tiled and for safety we recommend a slip resistant tile. Gone are the days of boring, basic tiles – today’s tile manufacturers are creating tiles in all shapes and sizes, colours and tones to make it easy to find the perfect tile for your space. You can even have a tile that looks exactly like timber floor boards. Because you’re not limited by texture on the walls, the world is your oyster when it comes to choice. You can choose to personalise the space with a feature wall or strip, create colour and pattern with a variety of tiles, use tiles to highlight specific parts of the bathroom, or use the colour scheme to help intensify a certain mood or feeling you wish to create. 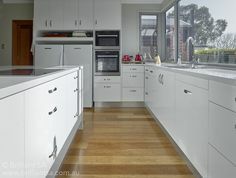 Large format tiles on walls and floors will give a clean look that’s easy to maintain. Here’s where most of your bathroom storage will be located so think carefully about how much you need to store and how often you’ll need to access the items inside. 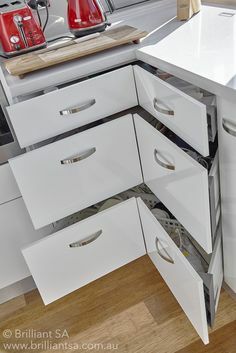 Drawers can be fitted with clever internal organisation to keep makeup, hair accessories, appliances such as hair dryers or straighteners, razors and perfumes/colognes easily accessible. Two basins or even his and hers vanities may be just the thing for you. Apart from the obvious function of showing your face, mirrors are incredibly useful in bathroom design. They also they bounce light around the room and can make a small bathroom feel quite spacious. 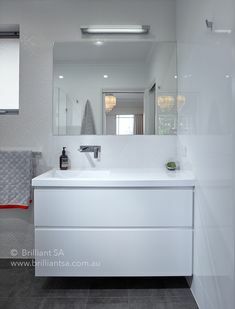 Mirrors can conceal a recessed shaving cabinet for extra storage and can even contain built-in makeup or shaving lighting for extra functionality. Available in all shapes and sizes, they can incorporate anything from de-misters to wireless speakers. Recent advances in technology make it easy to choose an environmentally-friendly toilet that also has great visual appeal that will match with the style of the bathroom’s design. Depending on the design and layout of your bathroom, you can choose from a back-to-wall toilet suite, or a wall-hung / wall-face pan with a concealed cistern. Latest models include hygienic rimless designs and high-tech Smart Toilets. Most major tapware manufacturers produce full ranges which include shower head and hand pieces, basin taps, bath spouts and handles to ensure you can choose a range with matching design credentials. Many colours and metallic finishes are now available in addition to the classic and durable polished chrome. 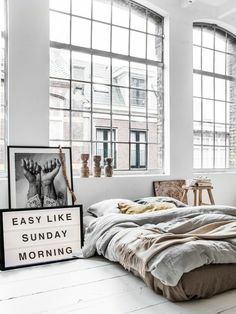 Your accessories include towel rails (which can also be heated), robe hooks, hand towel rings, shelving and such items. You would usually choose these to complement your tapware to achieve a cohesive design finish. An early consideration in bathroom basics is whether to include a bath. Within the wide variety of baths available your main choice will be between a freestanding bath or a back-to-wall bath. 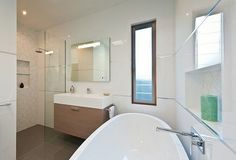 A freestanding bath, as the name suggests, sits out from the wall and sometimes is centred in the bathroom as the feature item. While popular and attractive, these tend to take up more space than built-in versions. A back-to-wall bath can combine the appeal and practicality of free-standing and built-in versions. If your space is tight, you may want to consider combining the shower and bath. 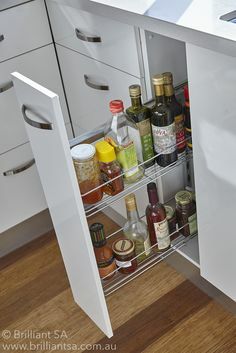 This will make the most of the space you have. 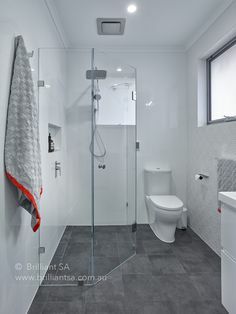 Where your shower is a standalone unit, it is usually encased with a semi-frameless or frameless screen. You may prefer single glass panel with a walk-in area for an open feel. Heating for the bathroom can come from both top and bottom with an increased popularity in heated floors complementing the range of light and heating options for the ceiling. The towel rail can also be heated for additional ambient heat. Lighting in your bathroom will consist of a combination of natural light – sometimes via a window or skylight – plus task and mood lighting. 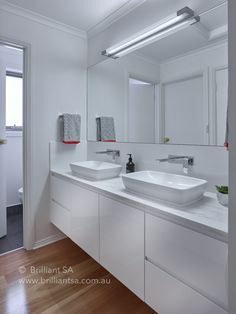 Ceiling downlights are complemented via specific task lighting in the vanity area. Feature lighting will add highlights and interest. LED light strips and some shower heads also offer additional chromatherapy settings. With a variety of light sources, it’s easy to create a range of moods to suit your needs. Of course, the best person to help you navigate beyond the bathroom basics is your qualified bathroom designer. 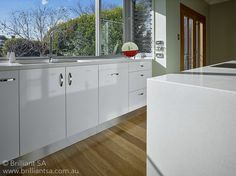 At Brilliant SA, we only employ bathroom designers with industry-recognised qualifications to ensure we offer our clients the best possible quality service. Give us a call today or drop into our showroom and let us bring your bathroom to life.